This section describes an example production environment for a working OpenStack-Ansible (OSA) deployment with high availability services and using the Ceph backend for images, volumes, and instances. deploying a ceph cluster by using the roles maintained by the Ceph-Ansible project. Deployers can enable the ceph-install playbook by adding hosts to the ceph-mon_hosts, ceph-osd_hosts and ceph-rgw_hosts groups in openstack_user_config.yml, and then configuring Ceph-Ansible specific vars in the OpenStack-Ansible user_variables.yml file. This example will focus on the deployment of both OpenStack-Ansible and its Ceph cluster. The following CIDR and VLAN assignments are used for this environment. The following host name and IP address assignments are used for this environment. Each host will require the correct network bridges to be implemented. The following is the /etc/network/interfaces file for infra1. If your environment does not have eth0, but instead has p1p1 or some other interface name, ensure that all references to eth0 in all configuration files are replaced with the appropriate name. The same applies to additional network interfaces. # for implementation on the other hosts. # in the case of one interface card failing. # control plane traffic on bond0. # specified on the host_bind_override parameter. # value of the br-vlan network, which is also the same 'eth12' value. 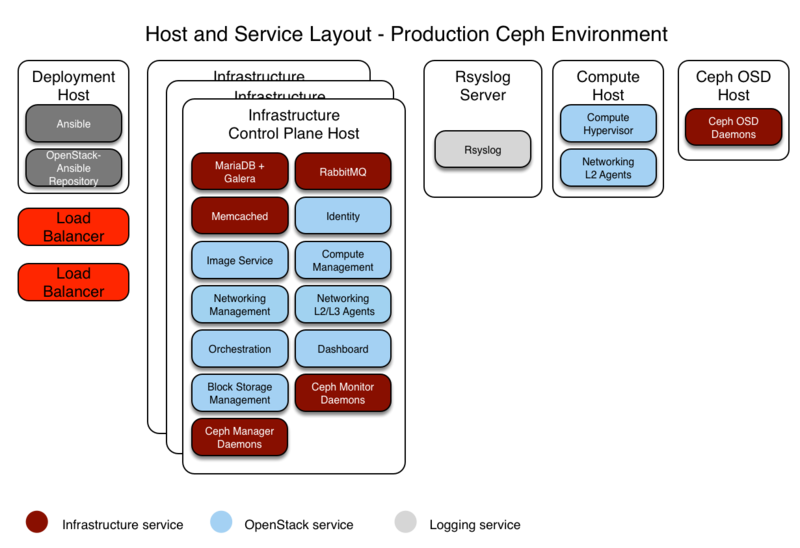 The /etc/openstack_deploy/openstack_user_config.yml file defines the environment layout. The following configuration describes the layout for this environment. # in the CIDR specified in haproxy_keepalived_external_vip_cidr. # endpoints the two addresses must be different. # Ideally the load balancer should not use the Infrastructure hosts. # Dedicated hardware is best for improved performance and security. The optionally deployed files in /etc/openstack_deploy/env.d allow the customization of Ansible groups. This allows the deployer to set whether the services will run in a container (the default), or on the host (on metal). # the cinder-volume service to run in a container. # iSCSI protocol, the cinder-volume service *must* run on metal. The /etc/openstack_deploy/user_variables.yml file defines the global overrides for the default variables. # to one active LB IP, and we use keepalived for that. ## additional configuration options availble.